Intel and computer manufacturer Acer have launched a seed program that will make Chromebooks available for schools to pilot. 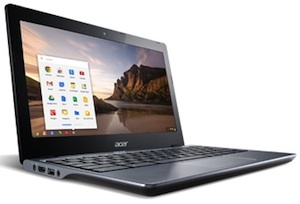 The program will provide the Acer C720 Chromebook at no cost to the school. The C720 is an 11-inch clamshell-style device powered by Google's Chrome OS. It offers 8.5 hours of battery life. In order to participate in the program, schools must complete an online application and agree to two conference calls with Acer. After a 30-day period, schools can "explore opportunities with an Acer representative for long-term use of the Acer Chromebook seed unit or return the system to Acer and owe nothing. Return shipping will be paid by Acer." Applications for the program are open now through April 15. Only one application per school will be accepted, and no more than three schools in a given district can apply, according to the rules of the program. Complete details can be found at k12blueprint.com.